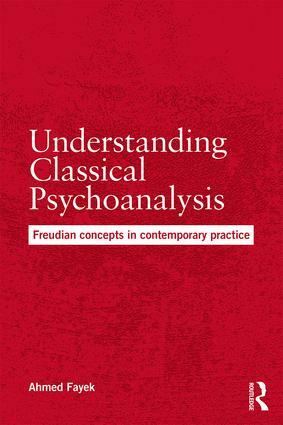 Understanding Classical Psychoanalysis gives a clear overview of the key tenets of classical Freudian psychoanalysis, and offers a guide to how these might be best understood and applied to contemporary psychoanalytic theory and practice. Covering such essential concepts as the Oedipal complex, narcissism and metapsychology, Fayek explores what Freud’s thinking has to offer psychoanalysts of all schools of thought today, and what key facets of his work can usefully be built on to develop future theory. The book will be of interest to psychoanalysts and psychoanalytic psychotherapists in practice and training, as well as teaching faculties and postgraduate students studying Freudian psychoanalysis. "This is a very timely book: Psychoanalysis is in crisis. Many attribute the crises to external factors changes in the zeitgeist and the culture, but Fayek contends the crisis is of our own making and I agree. The fault is not in our stars it is in ourselves. He confronts the crisis head on, considering what is foundational for psychoanalysis, what needs to be preserved and what needs to be changed. This book should be read widely because it is a credo for what it means to be a psychoanalyst. The final chapter on organizational structure and its negative impact on the field is very timely and important. "-Arnold Richards, Editor of internationalpsychoanalysis.net and Publisher, ipbooks.net. "Ahmed Fayek's call for a revision of psychoanalytic theory is as brave as it is necessary. Renovation, expansion, deletion, in all facets of our body of knowledge, from how the psychoanalyst understands the analysand to the technique he/she uses is the scope of Dr. Fayek's scholarly book. This challenge to revise theory and education along with the institutions that support psychoanalysis as it is now, says Fayek, must include psychologists, child psychologists, philosophers, sociologists, linguists, working together. I applaud Dr. Fayek for paving the way for a revolutionary project. His knowledge of Freud is deep and respectful but he encourages us to move ahead so that Freud's discoveries will not fade away. "-Jane S. Hall, LCSW, FIPA, Past President of the Contemporary Freudian Society, author of: Deepening the Treatment (1998) and Roadblocks on the Journey of Psychotherapy (2004). Ahmed Fayek is a member of the IPA, the APsaA, and division 39 APA. After fifty five years in the field – practicing, teaching, and training in psychoanalysis – Ahmed retired to focus on his psychoanalytic writings. His interest in German Idealistic Philosophy led him to Freud’s manner of thinking and from there to the theory of psychoanalysis.